Roy O'Bannon: [referring to the duel] This is serious. You don't come back from this. Marshal Nathan Van Cleef: That's the general idea. Perhaps that statement is a bit of an exaggeration, but perhaps I'm on to something. The obvious natural and easy chemistry between Jackie Chan and Owen Wilson went a long way towards endearing this work into my collection. As a solid fan of Chan's work, I have a modest (in comparison to hard-core fans) collection of his works. 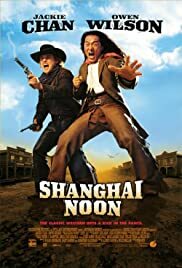 In consideration, I have to say that...while this attempt, like his other American attempts, does not exhibit enough of that marvelous comedic fighting style we all know and love, Shanghai Noon is genuinely enchanting, action packed, earnest, and entertaining. Owen Wilson is a natural talent. He brings an honesty to his otherwise shifty personae in everything he does. Frankly, I'm surprised at some of the places he has succeeded in making this work for him. He is a true comedic force on the big screen. This work is a rival to other comedy/action teams, and bears a serious viewing, as I feel it is comparable to my second favorite comedy western, "Cat Ballou." In case you're interested, "Blazing Saddles" is my first. Owen Wilson: Anaconda, The Haunting (1999), and the Big Bounce.